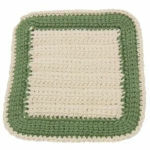 Rainbow Potholder -- $1.99 A Crochet pattern from Julie A Bolduc. This bright and cheery potholder would be a great addition to an outdoor barbecue. Just remember to keep it away from flames. Or it will melt.